Chikungunya is an infection caused by the chikungunya virus. Symptoms include the sudden onset of fever two to four days after exposure. The fever usually lasts two to seven days, while accompanying joint pains typically last weeks or months but sometimes years. The risk of death is a little less than 1 in 1,000; the elderly or those with underlying chronic medical problems are most likely to have severe complications. 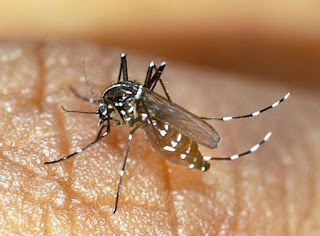 The virus is passed to humans by two species of mosquito of the genus Aedes: A. albopictus and A. aegypti.The virus circulates within a number of animals including monkeys, birds, cattle, and rodents.This is in contrast to dengue, for which primates are the only ones affected.